Are you looking for a way to bring fragrance into your home. We are very careful at our house bringing candles or anything that plugs in because of our 3 cats, 1 dog, and 3 kids. They are constantly knocking things over, spilling things, you name it. It is hard to find an air freshener that works without having a HUGE mess (or worse). 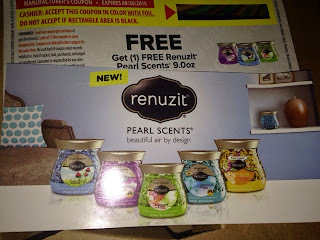 I recently received Renuzit Pearl Scents to review, and I LOVE them! As you can see, the packaging is actually attractive. It does not stick out sitting on my table, and blends with our decor. I will also add that (I know from experience), tipping the entire item upside down and letting it sit like that did not ruin my furniture-- it did not "leak" at all (this was courtesy of the 4 year old). I love the scent, which also acts as an odor neutralizer-- it is mild and just adds a nice long-lasting scent to my living room. Want to try it out for yourself? Enter below to win two coupons for a FREE Renuzit Pearl Scent! I love the smell of laundry drying on the clothesline. It reminds me not only of summer but of being little and helping my mom with the laundry. I like the smell of freshly mowed grass. I love the smell of honeysuckle! I like the smell of the ocean. I love fruity smells but also love the smell of fresh cut grass, I used to buy that scent of candle but cant find them anymore. My favorite summery scent is sweet pea. I like the smell of fresh cut grass. I love the smell of rain, there is nothing like that smell! Sparkling Rain leaves a nice refreshing scent. Anything with coconut in it. Okay, not ANYTHING! but pretty much anything tropical with coconut in it I’m digging right now. I’m actually loving Bath & Body Works Aruba Coconut Body Cream right now. YUM! I like florals, and lilac is one of my favorites. I like the smell of sunscreen in the summer! Especially coconut scented sunscreen! My favorite summery scent is coconut. Lavender or lilacs are my fave summery scents. Love the smell when the lilacs are in bloom. Fresh air is my favorite! My favorite summery scent would have to be sunscreen, the good smelling ones that smell like coconut. Brings me back to the summers I spent at the pool when I was little. I love the smell of Lilacs. My favorite summery scent would be melon or berries! My favorite summery scent would be "Blue Sky Breeze." 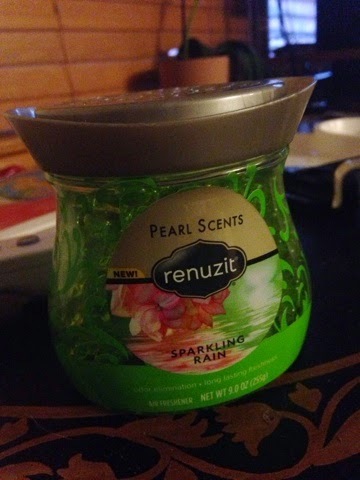 I love citrus kinds of scents in the summer...orange, lemon, lime...and I'd love the pineapple that this comes in, too! I really like the smell of wildflowers. I like the smell of coconut during the summer months. I like coconut and pineapple. I lean toward citrus scents. So refreshing!! The ocean is my favorite scent! The smell of cantaloupe. I eat it all summer. My favorite scent is lilacs and lemon grass. My favorite "summery" scent is lotus flowers! The ocean is one of my favorite summer scent. As well as fresh blooming flowers and ice cream.